1. Take cuttings and root them. Take 4 ” cuttings of healthy tips, remove flowers and lower leaves . Dip the cutting in rooting hormone and insert 2″ deep in a light well drained soil. Keep cuttings in a filtered light until roots form (3-4 wks). 2. Pot them up (trim up to 1/3 ) to keep them from getting to leggy. Grow them as houseplants by placing them in the brightest window for the winter. Water when needed and fertilize once a month. 3. Store geraniums in a dormant state. Dig up the plant and place it in a papper bag with holes in it or wrap the roots in newspaper. Hang the bag in a cool, dark space (basement, crawl space). Another old way is to hang them upside-down, bare roots in a cool, dark basement. Rehydrate the roots a few times during the winter by soaking them in water for a few hours. Pot up the plant in late winter (Feb) and resume watering. When the weather warms up place your wintered geranium outdoors . I’ve taken cuttings of my geraniums and planted them in tubs and pots and placed them on south west facing windowsills and a patio area. They are doing fine and one or two are even flowering. I live in Doncaster in Northern England; we haven’t had a frost yet, which is a bit unusual, but it never gets much below freezing here anyhow. HELP I brought my Geraniums in for the winter and they grew like crazy.I just repotted them and put them outside in the same spot they were last year. After just 2 days the leaves are turning very pale green and curling up. I know they don’t cost too much to replace but….. Your geraniums need to adjust to the drastic change in light exposure. Place the pot in a shaded, protected area for a few days so that it can acclimate to the outdoors. As they get used to brighter light, move them into the sun. At what temperature do geranium need cover so they wont get frost damage. Once acclimated, Geraniums can tolerate cooler temperatures down to 40F. Keep in mind any new growth is more suceptible to frost damage or cooler temps than older established growth. I have a few scented geraniums and I am wondering how to overwinter them or even if it is possible to do so. I’ve taken some cuttings from all and plan to keep them as house plants but I would really like to keep the parent plant also. Thank you for any information. You can winterover your scented geranium the same way as blooming geraniums-either as a houseplant on a window sill or in a dormant state. Cuttings can also be taken in late winter/early spring off the new growth on the parent plant. 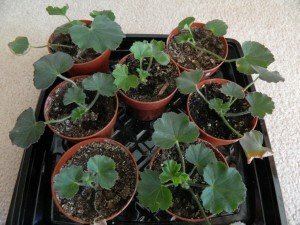 Is it possible to bring your potted geraniums in in the fall cutting them down to 3″ and put them in the basement for the winter after. Then begin to water in March. That is another way to winterover your geranium. I have not tired it but will this year. If all goes well, by cutting it down, it should regrow in the spring. Instead of cutting them down to 3″ it would be better to let the whole plant go dormant for the winter. Don’t let the pot dry out completely-give it a light drink during the winter to lightly moisten the soil. When spring comes you can trim back any dead material. By leaving more stems you will also get more new sprouts from the stems that can be used to propagate more new plants. Hi Kris, for years I have just brought them in and treated them like house plants. I put them in a sunny window and water about every third week. Then I gradually increase the amount of direct sun they are allowed once I move them outdoors. Thanks for the tip. It’s a great idea. I am in north central Ohio. What can I do to winterize and keep geraniums and mums. It is expected to frost and maybe freeze tonight (10/4). Thanks for your help. 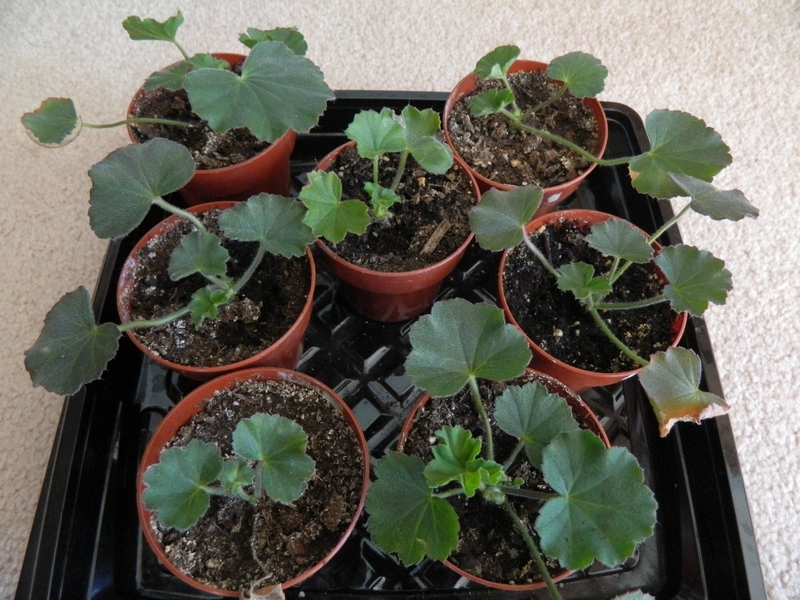 Geraniums are not hardy and will need to be brought inside. Place them in a sunny window for the winter and or take 3-6 inch cuttings, remove lower leaves and dip in root hormone and plant in a light well drained soil to start a new plants. Mums, if they are the hardy type, make sure you mulch them for the winter. If you planted them early enough in the season, they would have developed some roots and with any luck may make it through the winter. For successful results it is best to plant hardy mums in the spring so that they have a whole season to establish a healthy root system that can make it through the winter.